Bramfield is a Suffolk village steeped in history, containing many interesting features. As the sea is less than ten miles away Bramfield is well placed for the delights of both the countryside and the Heritage Coast of north-east Suffolk. Accommodation is easy to find with Bed and Breakfast offered at North Manor Farmhouse in the main village street. Self-Catering is available at Grove Farm House and in the wider local area. With Bramfield being centred around the crossroads of the A144 (A12 to Bungay road) and the lesser roads which lead to Walpole to the west and to Thorington and Wenhaston to the east, it might be all too easy to pass by and not appreciate all that Bramfield has to offer. At this crossroads stand the award-winning centuries-old Queen's Head public house, the picturesque thatched bus shelter and the Bramfield village sign. Just off the crossroads are Bramfield Primary School and the Village Hall. Easily seen along the Walpole Road is a gatehouse together with part of the boundary of Bramfield Hall which takes the form of a crinkle-crankle wall. These attractive sinuous brick walls are curved for strength and are very easy on the eye. On the opposite side of the road is the glorious white-walled thatched church of St.Andrew with its attractive lych-gate. 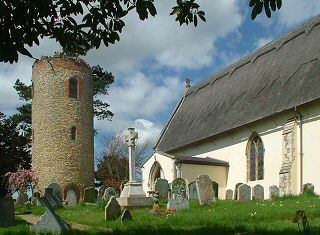 St.Andrew's, together with St.Peter's at nearby Thorington, are both round tower churches of which there are less than fifty throughout Suffolk. The round tower at Bramfield is over thirteen metres high with a wall thickness of over a metre and houses five bells, three of which date from 1440. However, Bramfield St.Andrew is unique in Suffolk in that here the round tower is completely detached from the body of the church. Remarkably, it is thought that the tower has always stood alone as there is no evidence to the contrary. The atmospheric interior of St.Andrew's is also notable with its fine rood screen, wall paintings, beautiful memorial to Mrs Arthur Coke who died in childbirth in 1627 and a plaque which mentions Hubert Miles Gladwyn Jebb, Lord Gladwyn of Bramfield, diplomat and founding Secretary-General of the United Nations. From time to time concerts take place in St.Andrew's Church. These, and other local events, are entered on the Blythweb Calendar. 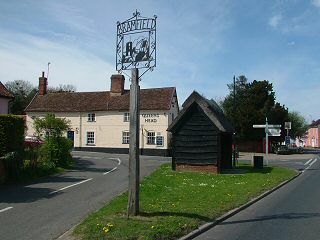 The A144 through Bramfield is also the high street. Among the mix of buildings old and new stands the 1841 United Reform Church and a milepost/mileiron made in Ipswich in 1818 which proclaims it is 98 miles to London. Local services include Bramfield Garage in the High Street, with a butcher, general store and post office in a side road. On high ground close to Bramfield is the unusual ringwork site known as Castle Yard. The exact nature of this castle through the centuries remains a matter of conjecture. Although of note there is no public access to this site. The surrounding area is typical north-east Suffolk countryside, abounding with birdsong and wild flowers. This productive undulating farmland with its lanes, hedgerows and woodland can be enjoyed by exploring the footpaths which lead off in all directions from Bramfield. To find out more about Bramfield click the menu buttons at the top of this page or click here for some at-a-glance useful information.